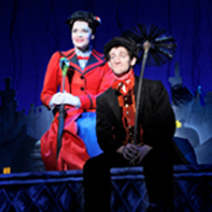 Everyone’s favorite nanny, MARY POPPINS, will use her combination of magic and common sense at the Civic Center Music Hall this summer. Based on the Disney movie of the same name, Lyric Theatre of Oklahoma’s production of this musical will delight the young and the young at heart, with classic songs like “Supercalifragilisticexpialidocious,” “Step in Time,” “Jolly Holiday,” and “Chim-Chim Cher-ee.” Starring Lindsie VanWinkle in the title role of Mary and Jeremy Benton as London’s jolliest chimney sweep, Bert, the show runs July 7 through 11. Also included in the cast are Jonathan Beck Reed as George Banks, Melissa Griffith as Winifred Banks, and Addie Wagner and Michael James as Jane and Michael Banks, respectively. Reed has been a fixture on Lyric’s stages for many years; recent Lyric credits include AN INSPECTOR CALLS (Inspector Goole), THE ODD COUPLE (Oscar), and LYRIC’S A CHRISTMAS CAROL (Scrooge). Griffith has performed with Lyric’s Musical Interactive troupe for several years; other credits include SOME ENCHANTED EVENING (Julie) and A LITTLE NIGHT MUSIC (Mrs. Segstrom). Addie Wagner played Young Eponine in Lyric’s 2014 production of LES MISERABLES, while Michael James played Gavroche in the same show. In addition, Matthew Sipress will choreograph, and David Andrews Rogers will music direct. Other members of the creative team include lighting design by Helena Kuukka and stage management by Julie Meyer. 40 minutes prior to each performance of MARY POPPINS, many fairytale princes and princesses from will be available to take photos and sign autographs for ticketholders in the lobby of the Civic Center. This pre-show event is hosted by Forever After Parties. After each performance, select cast members will be available to sign autographs and take photos.